New York City, Dallas and Toronto are all in the running to become Amazon's next Seattle. 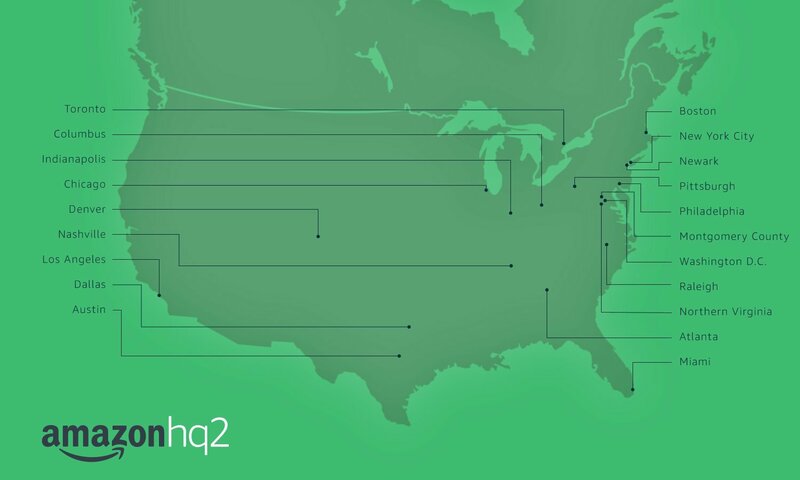 Amazon on Thursday announced which 20 markets made the cut as finalists for its full-fledged, second corporate headquarters. Cities started vying to become Amazon’s HQ2 — and for the presumed economic boom Amazon’s presence would bring — when Amazon said it was planning to build a second headquarters in September 2017. Two-hundred and thirty-eight cities submitted bids in October, offering gimmicks like Amazon package art installations and up to $7 billion in tax incentives. Atlanta, Austin, Boston, Chicago, Columbus, Dallas, Denver, Indianapolis, Los Angeles, Miami, Maryland’s Montgomery County, Nashville, Newark, New York City, northern Virginia, Philadelphia, Pittsburgh, Raleigh, Toronto and Washington, D.C.
Toronto is the only city outside the United States. Some cities on the list, like Raleigh, Denver, Nashville and Dallas, are home to growing housing markets. Over the next few months, Amazon will work with each of the 20 finalists to evaluate the feasibility of planting a headquarters there and request additional information about their proposals, the company said in a press release. Amazon plans to make a decision before the end of 2018. Amazon has promised to invest $5 billion in building its new headquarters and create at least 50,000 jobs. The indirect effects of Amazon’s presence would also likely boost the local housing market wherever the company ends up, and some real estate pros like Re/Max Co-CEO Adam Contos think that Amazon’s choice will end up helping facilitate a “booming” housing community. It’s not just Amazon that is looking to plant new roots. Separately, Apple on Wednesday announced it would establish an “Apple campus in a new location,” initially housing tech support, and that the location would be made public before the end of 2018. What are the chances that both Apple and Amazon end up vying for talent — and housing — in the same market?